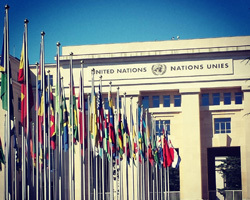 The Seventy-first World Health Assembly takes place in Geneva, Switzerland, on 21–26 May 2018. Delegations from countries around the world will gather, as they do each year, at the decision-making body of WHO to review and approve a specific health agenda prepared by WHO’s Executive Board. These are accompanied by a series of proposed strategic and operational shifts. Overarching themes of the GPW13 include emphasizing and strengthening work at the country level, and integrating the Sustainable Development Goals (SDGs) into WHO’s work across health areas. Member States will have the opportunity to review, discuss and ultimately consider whether to adopt the GPW13 during the World Health Assembly. In addition to the crucial matter of the GPW13, the World Health Assembly will introduce resolutions on a diverse array of important health issues, including: implementation of the International Health Regulations (2005); WHO’s work in health emergencies; the transition of the global effort to end poliomyelitis, now nearing its ultimate goal; environmental risk factors for health; access to medicines; preparations for upcoming high-level meetings on noncommunicable diseases and tuberculosis; mobile health (mHealth); physical activity for health; and more. Delegations will have the opportunity to debate and, in many instances, come to a consensus on global policies and actions in each of the areas in focus. A series of technical briefings at the World Health Assembly will also look at select health topics, including primary health care and the role of parliamentarians in achieving universal health coverage and global health security. “Alma-Ata at 40”, a pop-up panel discussion where participants can join experts and share their thoughts on the past, present and future of primary health care (11:00–11:30 CEST on Wednesday, 23 May 2018 in the Salle des Pas Perdus, Palais des Nations). This year’s World Health Assembly takes place against the backdrop of a major milestone for WHO – the 70th anniversary of its founding. On 7 April 1948, WHO was established on the principle that health is a human right and all people should enjoy the highest standard of health. This aspiration for better health for everyone, everywhere has guided WHO’s work ever since, and is embedded in the proposed programme of action that will take the Organization forward. This will also mark the first World Health Assembly since the election of WHO Director-General Dr Tedros Adhanom Ghebreyesus. WHO Regional Director for Europe Dr Zsuzsanna Jakab will lead the delegation from WHO/Europe at the World Health Assembly. Dr Jakab and her colleagues will work closely with delegations from countries of the European Region over the course of the 6-day event. The week begins on a celebratory note with a free event held in Geneva – “Walk the Talk: The Health for All Challenge” – on 20 May 2018. Those outside of Geneva are encouraged to take part by sharing on social media what they are doing to promote a healthy life. The proceedings of the World Health Assembly will be webcast live and, as in years past, World Health +SocialGood will offer live interviews with experts direct from the event. These will be available at 16:00 CEST on 22–24 May 2018 via Facebook and Twitter. To follow proceedings online or join the conversation, use the hashtag #WHA71.